You’ve just finished prepping a meal. You have a bunch of leftover vegetable scraps – onion pieces, a bit of chopped tomato, some extra pepper, the end of a zucchini, a single garlic clove, whatever. Or, maybe you had a whole rotisserie chicken or a roast and find yourself with some leftover bones with a few bits of meat attached to them. Maybe you even have a leftover turkey carcass after Thanksgiving dinner. For most families, almost all of this would hit the trash can. A few families might be able to toss the vegetable scraps into a compost bin at least. In the end, though, they’re simply trash for most people. Over the last year or two, we’ve started doing something very different. Whenever we have scraps like this, we throw them into a bag in the freezer. We have a “misc. vegetables” bag and whenever we have some bones or meat scraps, we put them into a freezer container that’s appropriately labeled with the contents. Then, when we’re starting to build up a few quarts’ worth of material in the freezer, we bust out the crock pot and make ourselves some stock. In the picture above, all we did was take about two or three quarts worth of leftover vegetables stored up over a month or so, toss them all in the crock pot, add enough water to cover the vegetables with about two inches more (and, yes, some of the vegetables will float), and then add a bunch of pepper and a bit of salt. 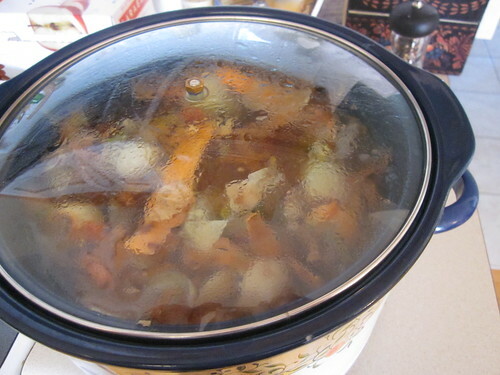 Then we just turn the crock pot on high and let it sit for a long while – four hours or so. At the end of the time, we just get out a strainer, pour the liquid through the strainer, and collect the liquid on the other end. That liquid is, in this case, vegetable stock. What do you do with vegetable stock? Whenever you’re making almost any dish at home that uses water as a component, we substitute the stock for incredible flavor effect. Soups. Stews. Shepherd’s pie. Stir fry. Anything. How do you store it? Usually, we use the stock within two or three days of making it, so we just store it in a jar in the refrigerator. If you’re going to keep it for longer, it can easily be frozen, but when you thaw it, you’ll need to stir it thoroughly. What about chicken/beef/turkey stock? 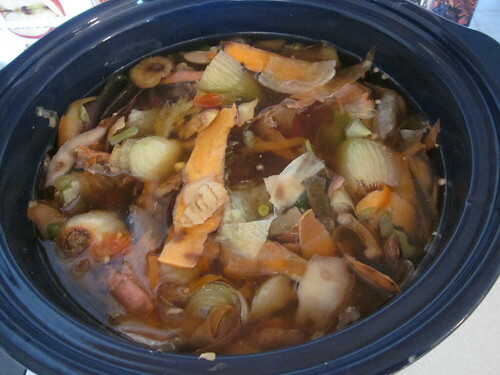 If you have bones and cooked scraps left over from any meat dinner (yep, fish works, too, if you want to make fish stock), just use them as a component in the stock. If you want to call it chicken stock (or beef stock, or fish stock, or turkey stock…), I would use 50% meat and 50% vegetables. The procedure is still the same: add water to the pot until you have two inches or so over the top of the items in the pot, then boil it for a few hours with a lid on it so you don’t lose liquid to the steam. Then, when you’re done, strain it to get out the big pieces and keep the liquid. Cooking gold. The next time you have vegetable scraps or leftover bones that you’re going to throw out, consider keeping them instead. Use them to make stock on a lazy day, then make yourself some mind-blowingly delicious meals with that liquid. It’s incredibly cheap, gets more use out of an item you would have thrown away, and makes your homemade meals that much more tasty.